One man’s mission to revive meade, the drink of the gods. 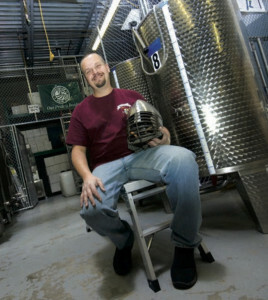 Paul Holm shed the armor of weekend knighthood to found Long Island Meadery, one of 106 nationwide. The redolence of hard working yeasts tickles the olfactory senses amid barrels, carboys and cases of bottles stacked to the ceiling. “Feel the heat of this fermenting cyser!” says Paul Holm, standing among the rows of gleaming stainless steel tanks filled with seething apple juice and honey. Wizardry is hard at work and Holm is the sorcerer, recreating history’s oldest source of libation. 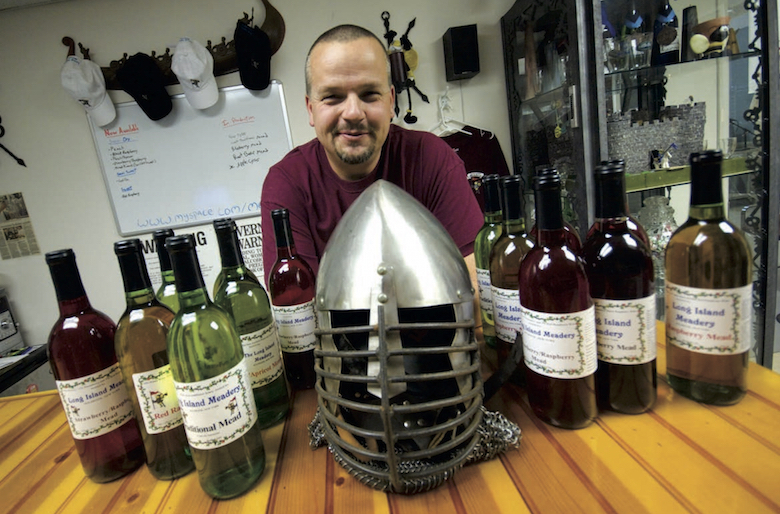 In 2004, Holm shed the armor of weekend knighthood to found Long Island Meadery, one of 106 nationwide. As Long Island wines are garnering ever more accolades, mead, the classic toast of old, remains overlooked amid the profusion of medals, awards and flattering exposure. Still, orchards, fields and flowers by way of industrious bees, become part of the ancient alchemy that transforms honey and yeast into mead. Back in time primordial some ancient, anonymous beekeeper neglected a diluted honey pot, which to civilization’s delight began to ferment. Besides its ability to confer strength and longevity, mead was renowned for fertility, so bridal pairs consumed this elixir for the lunar month surrounding the wedding, hence, honeymoon. Odin, the supreme creator in Norse mythology, gained immortality through magical mead, fallen Viking warriors in that bellicose heaven of Valhalla quaffed it from drinking horns, and for pagan Celts, a river of honey wine flowed through their afterworld. Although extolled in Greek mythology, viticulture caused mead’s Mediterranean decline way back in classical times. Gradually, vineyards spread northward while wine importation breached the cold Nordic bastions until the drink of kings fell from grace. By the mid-19th century, this drink once acclaimed in song and verse became a rustic peasant repast in rural England, Poland and far Ethiopia, but it’s fitting that someone enthralled with the medieval life, who also happens to possess a good Viking surname, would promote the Long Island renaissance of mead. But don’t look for Holm’s 30 varieties of mead amid bucolic fields decked with hives of quaint straw skeps. Follow instead the signs of bees clad in armor, past the line of warehouses of Continental Marble and assorted beverage distributors that lead to his shop in Holbrook. “I’m a mead-maker not a beekeeper,” he states, “but I still am a member of the Society of Creative Anachronism,” the world-wide medieval reenacting guild. The praise became so convincing that he ran the gauntlet of permits and business plans to open November 6, 2004. “I picked this 1,800-square-foot unit because of its two powerful air conditioners,” needed for temperature control. Holm makes metheglin, herbal mead that forms the root of the word medicine, including a root beer version. He also makes an array of melomel—honey fermented with fruit ranging from raspber- ries (both red and black), peaches and apricots, to strawberries and apples, with an alcohol potency ranging from 10 to 13 percent. Just as honey wine was creeping back into our culinary vernacular, colony collapse disorder (CCD) struck. When CCD hits a hive, its worker bees mysteriously perish; blame for the disease include stress, pesticides, tracheal mites and even a type of bee megavirus. “Bee pollination is directly responsible for 30 percent of our food,” Holm states, “but research indicates that stationary hives have not had CCD problems. Five national labs study the disease, and bee hives trucked to seasonal flowering of crops are most affected.” While it may never strike on the scale of phyloxera, the 19th-century blight that ravaged vineyards world-wide, “it may mean higher mead prices,” he warns. Still, Holm remains upbeat. 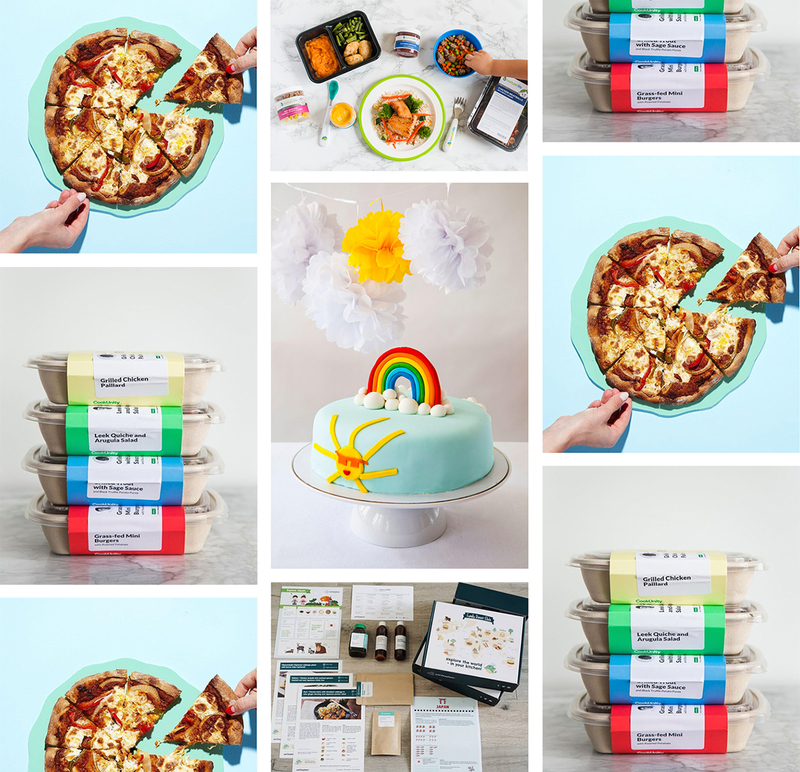 He recently commissioned an artist to design a new eye-catching label, and landed a distributor to market his products at 30 stores in 14 New York counties from Suffolk to Ulster. At the 2005 International Mead Festival and the 2006 Great Lakes Olde World Cider competition, Long Island cyser earned gold medals, but Holm is not so interested in winning awards. Instead he dreams of taking his interest in mead to a brew pub to make braggart (Welsh ale made from honey) and even to a distillery to make honey-based spirits. His broader goal is more cultural, since, historically, mead drinking involved elaborate rituals of toasts from goblets, horns, mazer and mether cups given and received among appreciative deities, nobility, alewives and yeomen. Amid its 21st-century revival, have an open heart, a clear palette and give a cheerful yet sincere wassail when you sample and savor a draught of the nectar of the gods. Editor’s note: Long Island Meadery has closed.